Okay WOW! That's amazing! To be honest I was worried about your scar after the surgery! Not any more! And only because Gabe had a surgery on his neck a few years ago and it has taken quite awhile for his scar to not be as noticeable. Lookin' good! Have a great weekend! OMG - That's amazing!!!!!! You definitely have a GREAT surgeon! I'm happy for you because I know that sometimes with the thyroid surgery the scars are not so nice!! Wow - that's just awesome!! Your healing is amazing Amy...I am so glad that you had such a good surgeon. It looks really good, Amy! 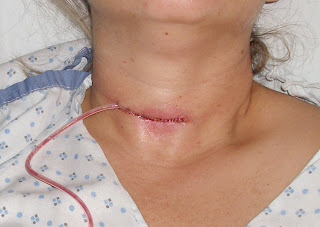 The neck has such thin skin--you are lucky to have such a good surgeon.